Live in Lakeland? Is a Payday Loan the right decision for you? Get the facts and see why so many customers turn to Amscot. Payday Loan. Cash Advance. Essentially, they’re the same thing. Here, we call it an Amscot Cash Advance* to emphasize one of the most convenient aspects of choosing Amscot. While other providers may give you a check, our approved Cash Advance customers walk out with cash! When things come up, you could get up to $500 in minutes. Why is a Cash Advance (Payday Loan) a popular money management tool? Not only is it fast and convenient, it often costs less than late fees on an overdue bill. Below are some more helpful links. Or, click the "Get Started" button on this page if you’re ready for the next step. Why do so many Lakeland residents choose Amscot for a Cash Advance? No credit checks, no hassles. Our approval process is very fast because we know your time is valuable. We’re there when you need us, 365 days a year. And some locations are open 24 hours! From Payday Loans to Notary Services ... we do it all. 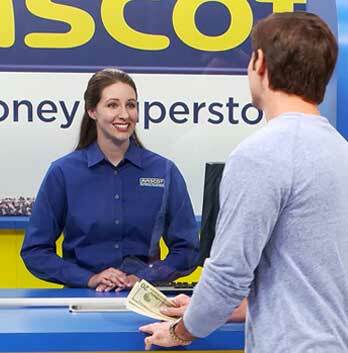 Amscot became known as The Money Superstore® for a good reason. In addition to an Amscot Cash Advance (payday loan), you’ll find a full gamut of convenient financial services. You can cash checks. You can get free, unlimited money orders. You can pay your bills electronically. Wire money. Send a fax. Make copies. Buy stamps. And use a well-lit, accessible ATM inside the branch. You can even obtain and load an Amscot Prepaid Mastercard. Need something notarized? Come on in! Each branch has a notary on duty 365 days a year, early to late – and we even have 24-hour locations for added convenience.